PHPI gets the lowdown on a recent boiler installation project for a church that dates back to 1848. The chapel’s previous heating system was at least 40 years old and could not meet the demands placed upon it. As part of a system overhaul the boiler was replaced and the heating system was extended to the upper levels of the gallery, which had previously relied on heat rising from below. Double glazing was also fitted along with loft insulation to increase the thermal efficiency of the building. Alpha Heating Innovation’s smallest combi boiler, the E-Tec, was chosen for the project. Keith Hallett and his son Owain, of Bryncerrig Heating were responsible for fitting the new boiler, along with three pumps, which were necessary to boost efficiency around the location’s large, three-zoned central heating circuit. The standard E-Tec, like all E-Tec range boilers, fits easily into an average kitchen cupboard and features a stainless steel heat exchanger for optimal reliability, says the company. Available in both 28 and 33kW outputs, the unit comes with a five-year warranty as standard, which can be increased to seven-years with the addition of the PremierPack Pro. In another recent success story, Alpha’s FlowSmart with Climatic RF controller was specified to accommodate the high hot water demand required in an 18th century residential farmhouse. 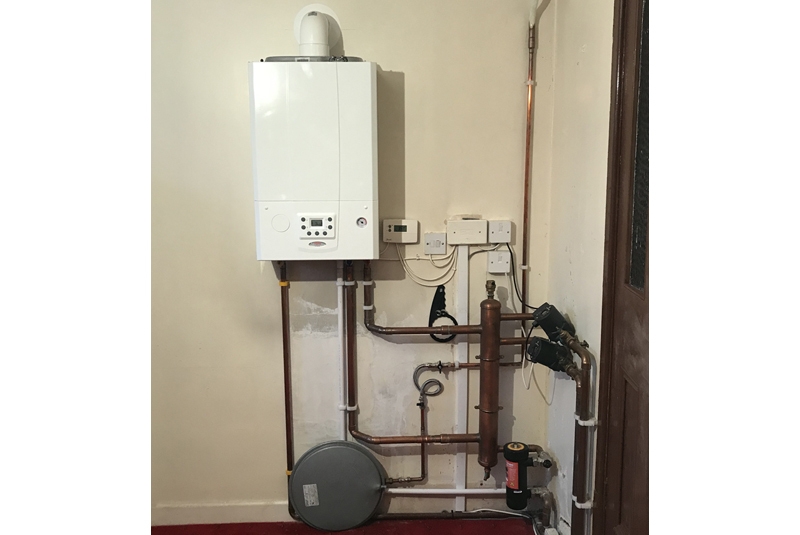 After the previous boiler had broken down, the farmhouse needed a system that could heat 23 radiators and provide enough hot water for the two bathrooms in the property. Combining the Alpha InTec 40GS combi boiler with a built in GasSaver and thermal store technology, the FlowSmart pre-heats mains cold water within the GasSaver by reclaimed boiler flue gases. It then passes through the thermal store’s stainless-steel coil heat exchanger, where it is heated further by surrounding hot water from the central heating system. From this, the water will then pass through a blending valve, where it is controlled to an optimum 30ºC before entering the boiler. In effect, the mains water is pre-heated and the boiler’s workload is significantly reduced.